Many people are using the meal replacements as the quickest way to lose weight. While it can be effective, it needs a lot more to have a major weight loss. it is all in choosing the right kind of meal replacement. A small reset in the diet would also help with it, like having a meal replacement shake, one time a day. 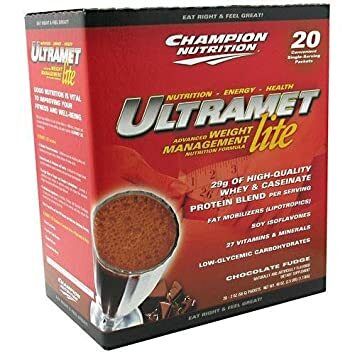 Champion Nutrition Ultramet Lite meal replacement is an intelligent mix of ingredients that supplies protein for the body and reduce the carbohydrates intake. It is considered as a complete meal with all that is needed in a meal for health and to allow natural weight loss. What is Ultramet Lite meal replacement? Ultramet Lite meal replacement is a multipurpose ‘meal’ that suits one and many. It is helpful to building lean mass; reduce weight, a healthy replacement meal option for a busy mother to stay healthy and fit. The options are many. When you are running out of time, this is your go-to option for a healthy meal. Just mix and drink. Ultramet Lite meal replacement is mainly used as a weight loss aid. It contains many of the macro and micro nuttiest essential for the body. It is helpful to building lean mass; reduce weight, a healthy replacement meal option for a busy mother to stay healthy and fit. Ultramet Lite meal replacement contains many of the macro and micro nuttiest essential for the body. They are all added in the right amount depending on their specific needs. This combination enables it to burn more amount of fat and reduce the conversion of carbohydrates into fat. There is a total of 27 vitamins and minerals. The ingredients also include fiber to keep you fuller and controls appetite for longer. There is protein, low carbohydrates and also a low amount of fat. One cannot completely avoid fat from the diet. It has to be added but in a small quantity. The fat added here is mere 6 gms. There also are flavoring agents added to create the available 2 flavors of Chocolate fudge and vanilla cream. For the chocolate flavor, low-fat Dutch cocoa is used. Makers warn that the product is made under facilities that might have tree nuts, soy, wheat, and crustacean shellfish in addition to milk and egg. How to take Ultramet Lite meal replacement? Ultramet Lite meal replacement comes in individual packs that are ready to use. Each packet contains 12 oz of the meal replacement powder that needs to be mixed with your choice of liquid. It is instantly dissolved in water, juice, or milk. Ultramet Lite meal replacement can be taken 1-2 times a day. The only thing to make sure is to mix the contents ONLY in cold liquid. Ultramet Lite meal replacement is mainly used as a weight loss aid. It is more effective as a dietary supplement to have complete nutrition for anyone. Using it as a meal replacement would be the added advantage than as a sole way to lose the extra body weight. How Ultramet Low Carb works? Low carbohydrate diet is one of the unhealthy ways to lose weight. You do lose weight but that would be the muscle weight that you end up losing. When the body is deprived of the carbohydrates, muscles are the next easiest source of energy. This is why a low carb diet should always have a good amount of protein for support. Ultramet low carb meal replacement definitely has a good amount of protein that the body can make use of as energy source and also boost the muscle development. Due to the composition of this meal replacement, it is useful for many purposes. Because of the presence of high protein and low carbs, it is helpful for weight loss. the balanced constitution of the nutrients makes it an ideal deal for the development of a healthy body. The high protein is helping those hitting the gym and wanting to development some lean muscle. Taking this mix before can help them have better energy and endurance. When taken after workouts, it maintains or develops muscles. Overall it is a perfect formula to boost the metabolism and at the same time trigger fat burning at a better rate. The fiber constant keeps the stomach feel fuller for longer so you can forget about the snacking every now and then. Customers are highly appreciative of the fact that the Ultramet Lite meal replacement comes pre-measured. You don’t have to measure the right amount every single time you use. Simply open the pack, transfer the contents and shake, shake, shake! People also comment on the flavor of Ultramet Lite meal replacement. They say it is nothing like other meal replacement shakes that they tried. This one has a pleasant flavor that doesn’t make you go away. Many urge you to take it in the morning for best results and also to use a shaker to mix it well. Although the makers say that it is instantly dissolvable, the users say otherwise. If you don’t use a shaker or blender, you can find lumps of the powder not dissolved. Janet mixes Ultramet Lite meal replacement with almond milk to make it thicker. She takes it in the morning for a great filing. Janet does not shy away from mixing other ingredients like fruits, nuts, and peanut butter to make it richer. She has been using it for many years and is totally satisfied with it. SRK who is diabetic used it as a preparation for the bariatric surgery. It makes a great filling with low calories and the vanilla is a great flavor to go with many ingredients, is what this user has to say. Another user states that this taste like a desert shakes. It was initially used as a post workout drink and later became a recovery shake and also as a lean mass booster. The user could achieve 5% difference in the body fat with the help of this Ultramet Lite meal replacement. Ultramet Lite meal replacement is ideal for sustainable energy and reduction in body fat. Though it doesn’t taste like the traditional protein shakes, this meal replacement has proved its worth. The formulation with low carbs and favorable flavor makes this a big hit. You just have to try it to know it for yourself.